Redwood Ridge is a name I made up to keep things straight. 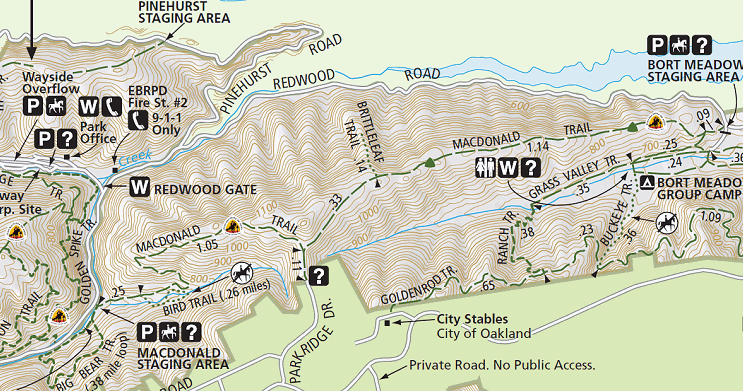 Let’s start with the part of the USGS topo map showing the south end of Oakland’s redwood country. Redwood Ridge is just east of Skyline Ridge (another name I made up), which starts where Joaquin Miller Road meets Skyline and extends to Lake Chabot. Oakland was a redwood lumbering town before it was anything else, and the great redwood groves gave their name to features all over the hills. 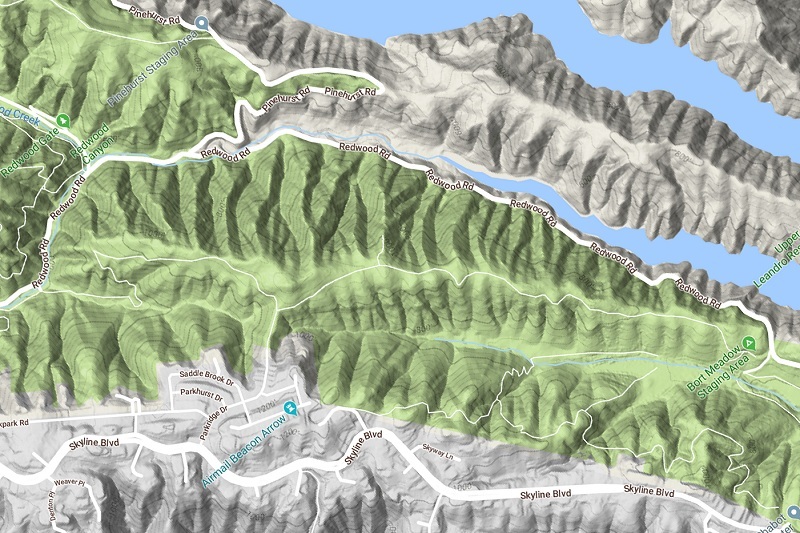 Redwood Peak sits at the top of the map, and east of it is Redwood Creek running down a straight valley that leads to Upper San Leandro Reservoir. That valley has no formal name, so I dub it Redwood Valley, the valley of Redwood Creek. 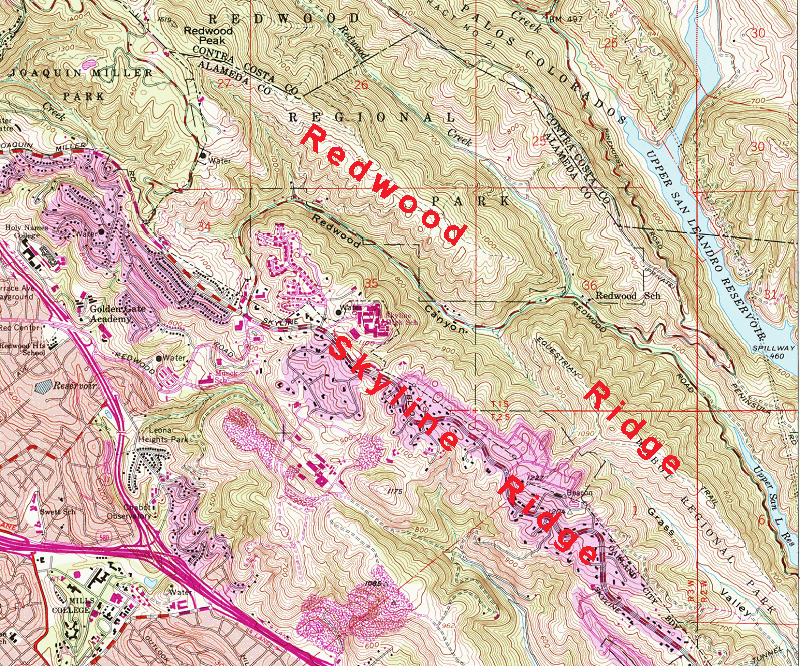 A major tributary of Redwood Creek flows out of a steep-walled valley named Redwood Canyon, clearly marked on the topo map starting with the 1947 edition. So, Redwood Canyon cuts through Redwood Ridge and ends in Redwood Valley at the point where Redwood Road meets Redwood Creek. Got all that? Good, because I won’t repeat it. From here on out I’ll show maps that have been tilted for easier viewing. 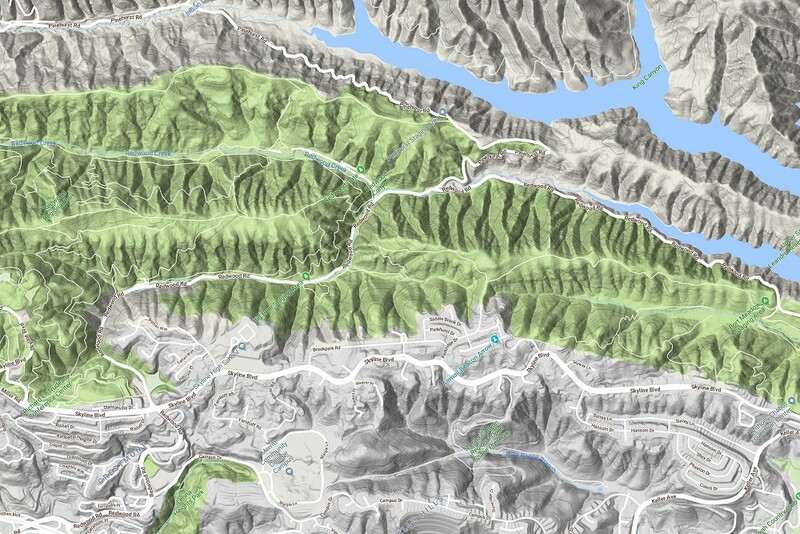 Here’s Redwood Ridge in the handy terrain view of Google Maps. 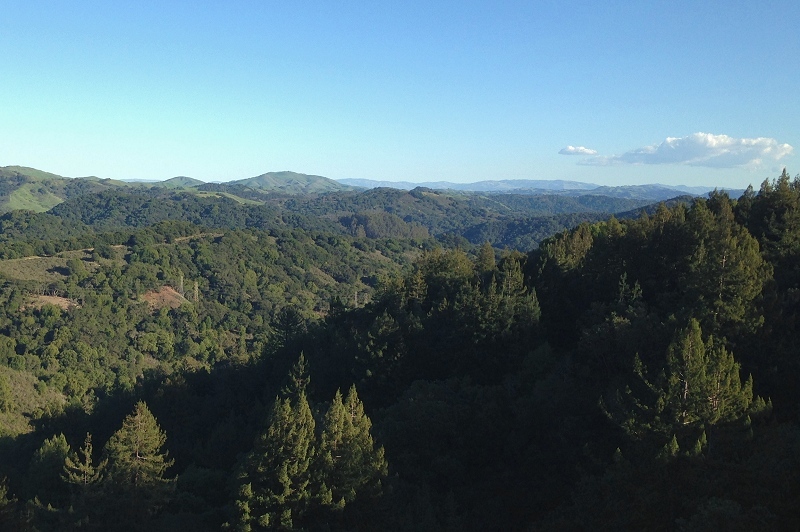 This post is about the south part of Redwood Ridge. It’s a pretty cool piece of land, just to look at on the map. 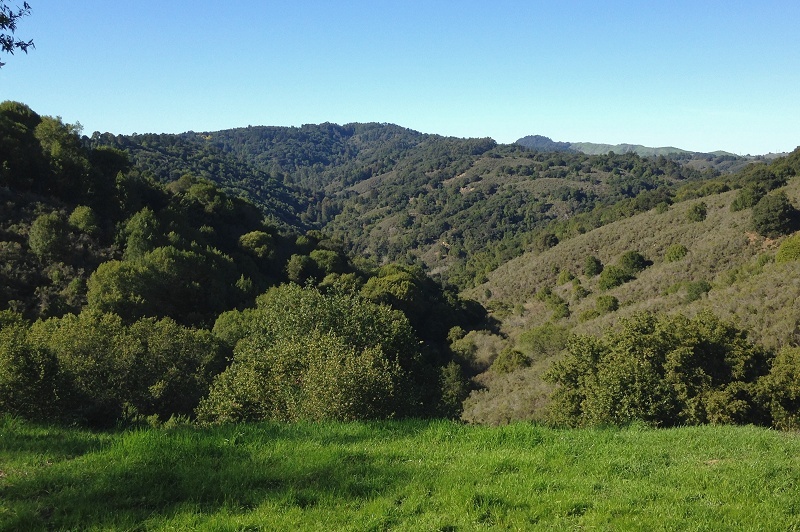 The top side is bounded by Redwood Valley and the left side is defined by the lower part of Redwood Canyon, a classic water gap. Now look at the bottom side. 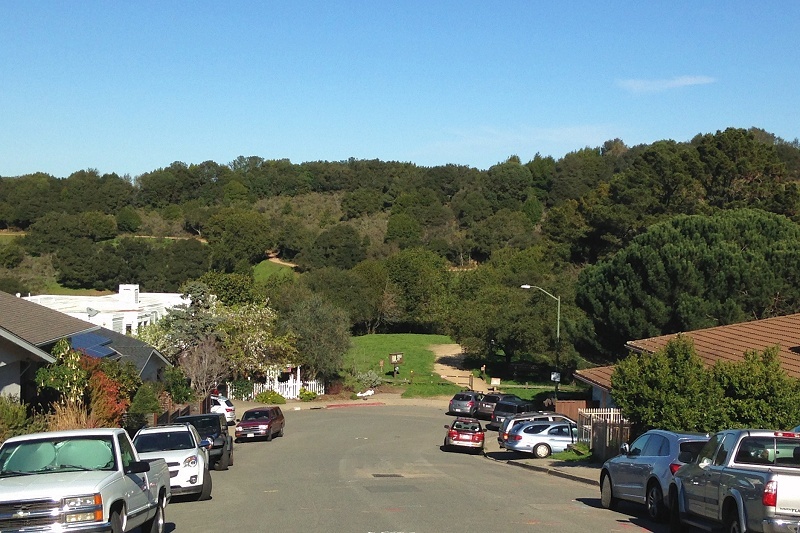 On the right is Grass Valley, with Grass Valley Creek flowing through it down to Lake Chabot. 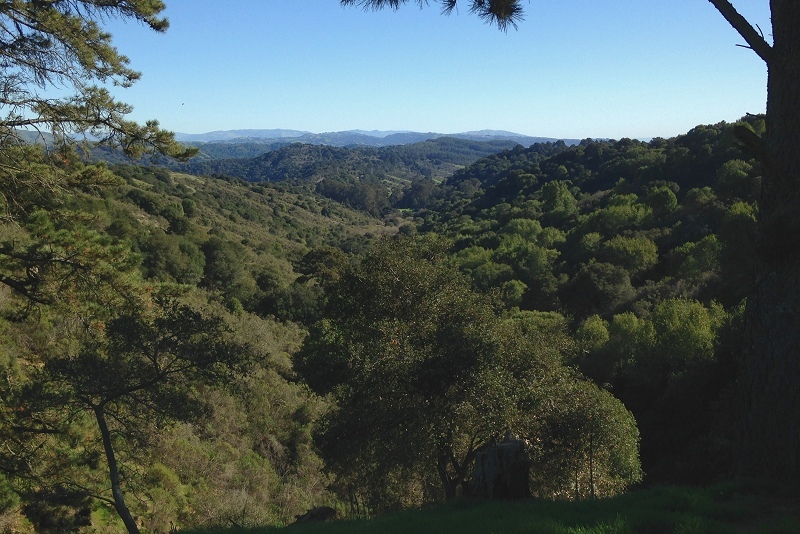 On the left is a smaller valley that lines up with the upper part of Redwood Canyon. It has an unnamed stream in it. I’ll call it MacDonald Creek, because that’s the name of the trail there. The last thing to notice is that little land bridge leading from the end of Parkridge Drive, right where the valleys of MacDonald and Grass Valley Creeks meet. The two creeks have been eroding their way toward each other. They seem to be evenly matched, but I think Grass Valley Creek may have a slight edge. The photo portion of this post starts there. But first, the bedrock map. It shows that those two creeks have been exploiting the softer rock of the Shephard Creek Formation (Ksc), sandwiched between the Oakland Conglomerate (Ko) holding up Skyline Ridge and the Redwood Canyon Formation (Kr) holding up Redwood Ridge. 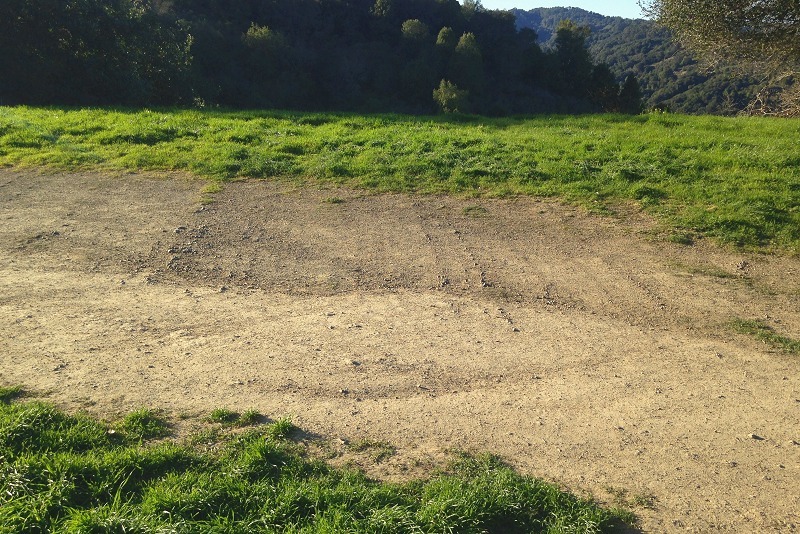 Rare are the places where Oakland’s bedrock is expressed so clearly on the landscape. And here’s the park map with the details on the trails. As you descend Parkridge Drive to the trailhead, Redwood Ridge appears as an island of forest. Starting out across the bridge feels magical. 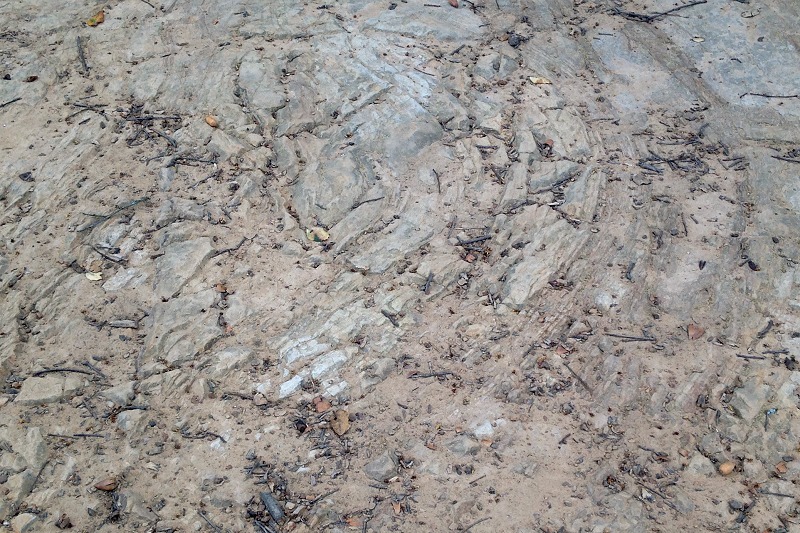 And at the right time of day as if by magic, the bedding planes of the Shephard Creek Formation appear out of nowhere. 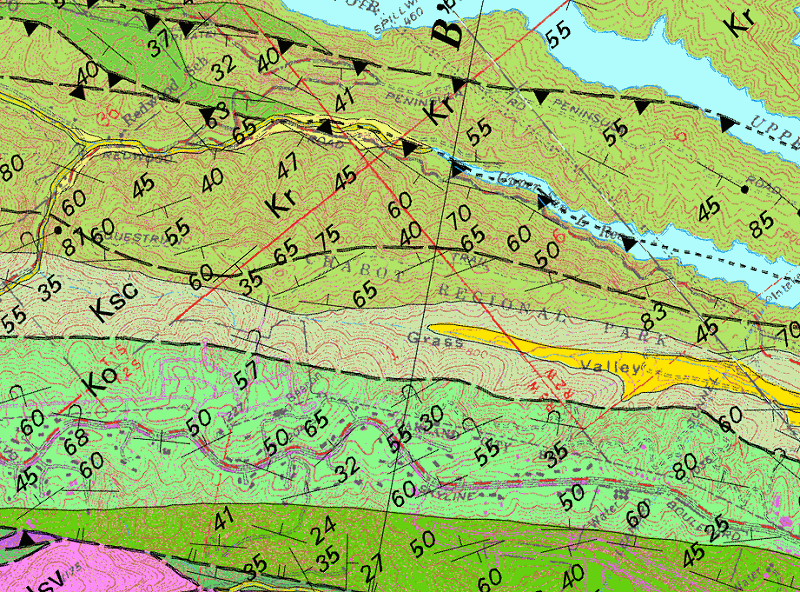 The geologic map indicates that these beds are overturned. The view from the bridge extends to the right down Grass Valley toward distant Mission Peak overlooking Fremont. And to the left, the view from front to back encompasses MacDonald Creek valley, Redwood Canyon, the massif of Redwood Peak and Round Top beyond with its bare southern shoulder. Redwood Canyon still grows a few redwoods, but in the mid-1800s they must have filled the canyon to the brim. The MacDonald Trail is excellent for all users, including horses and (since 2016) bikes. The woods are enchanting in any weather, but they photograph best on shady days. So does the bedrock in the road. The Redwood Canyon Formation is primarily fine- to medium-grained sandstone that shows the marks acquired over 80 million years of geologic history. It’s soft enough to be graded without blasting. The ridge stands as high as it does not because the rock is especially hard, but because it absorbs water so well, inhibiting the surface runoff that so effectively erodes the stream valleys all around it. Off the road, the sandstone occasionally crops out in bulbous boulders. When Jim Case mapped these rocks for his PhD thesis in the early 1960s, he described these as “cannonball concretions,” but from my observations so far I think he was mistaken, and the description of this unit on the geologic map (circa 2000) does not mention them either. I think this is ordinary weathering like you see in arid and semiarid country all over the West. The previous three photos are from the north side of the trail. 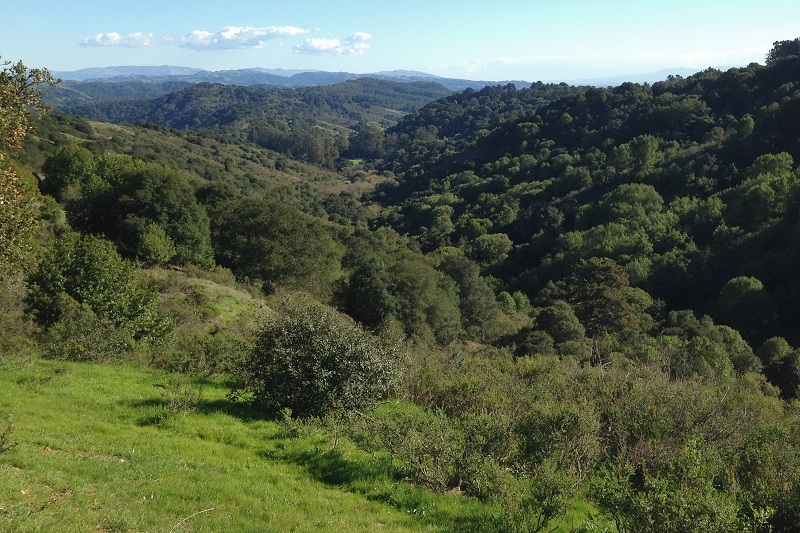 The south side offers wider views of Grass Valley and beyond to Loma Prieta and the Sierra Azul west of San Jose at far right. 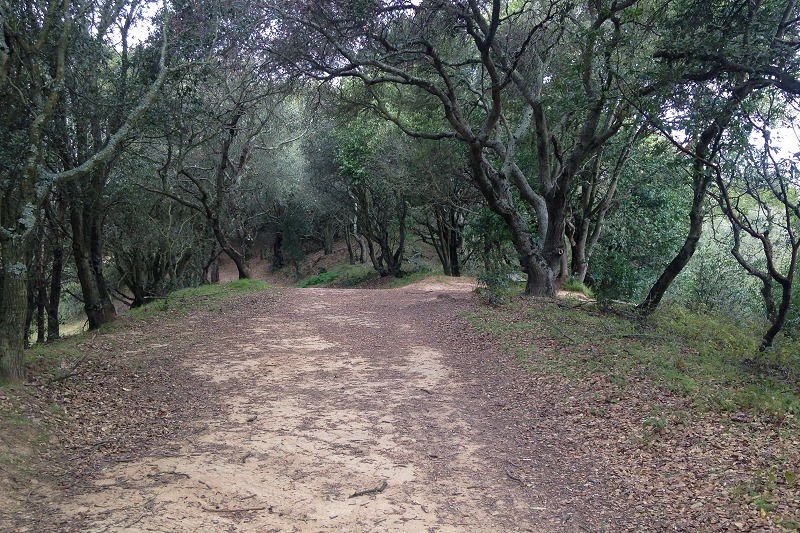 And you must not miss the stub of Brittleleaf Trail, which leads to a sandstone spur overlooking lower Redwood Valley. Surrounded by blooming manzanita at this time of year, the tranquil spot hums with bees and invites a long sit. Naturally I inspected the sandstone and determined to my satisfaction that its beds are overturned and dip steeply at 75 degrees. 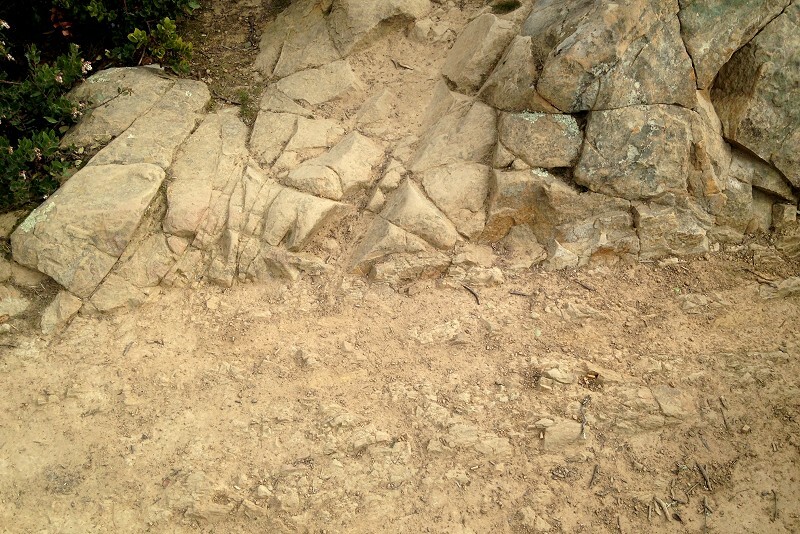 Notice that the fractures in the sandstone have no relationship to the original bedding. The view south from here looks over the reservoir and watershed lands, the bare green ridge known as The Knife west of San Ramon, and the Diablo Range mountains south of Livermore against the horizon. 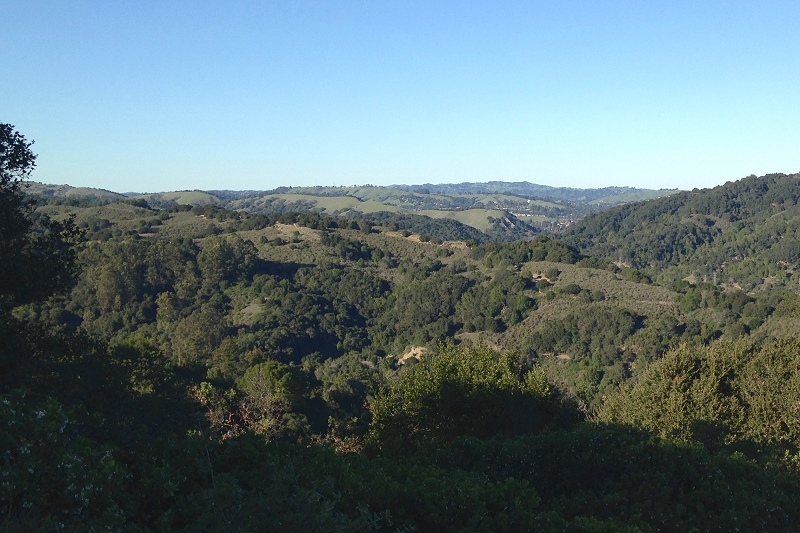 The view north, from far to near, includes the Briones Hills, tower-topped Mulholland Hill in Orinda and Moraga, the south end of grassy Gudde Ridge with its water gap where Canyon Road cuts through, a bit of wooded Canyon Ridge, and chaparral-covered Pinehurst Ridge, the type area of the Pinehurst Shale. All are worthy destinations of their own. This is the best time of year to see these lands. 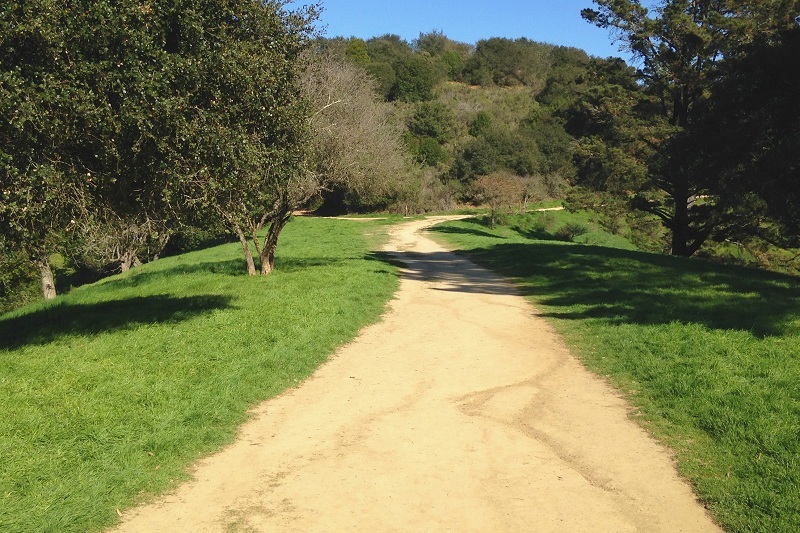 Among other reasons, the poison oak has begun to sprout, making it easily visible, but not yet spread over the woods and side trails, keeping you out. 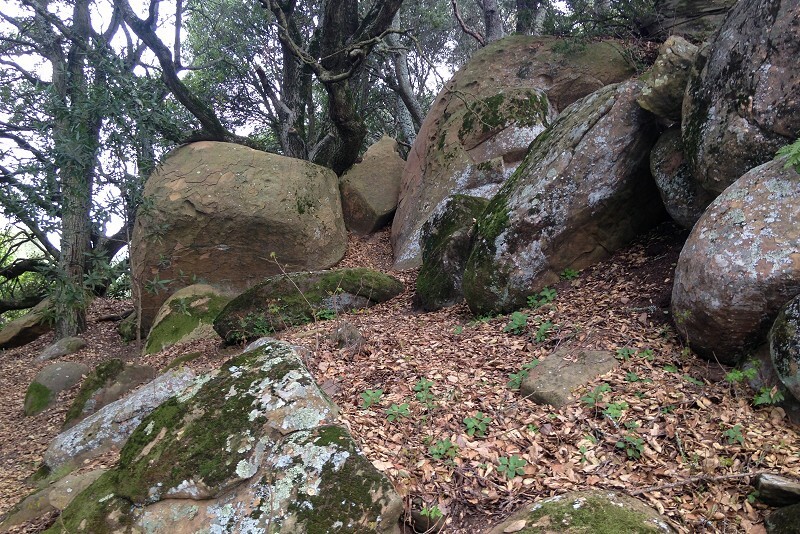 This entry was posted on 19 February 2018 at 11:15 am and is filed under Oakland geology views, Oakland rocks. You can follow any responses to this entry through the RSS 2.0 feed. You can skip to the end and leave a response. Pinging is currently not allowed.